Out of the washroom and into your arms! Imagine your boos walking by your desk and seeing a pee droplet and a poo chunk staring back!!! 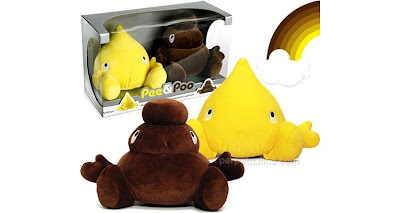 Pee&Poo are available in a duo pack - together forever! They are made in a cotton plush (80% cotton and 20% polyester) and filled with fiber. They measure 6" tall and are CE marked meaning they are suitable for all ages!